I forgot to post these from last week! Last Monday (the 9th) was Faith's class festival. We opted to let Ben skip preschool and come too, so we didn't need lunches on that day. Wednesday was the kids' last day of school before Spring Break and Faith's school had a hot lunch day, so only Ben needed lunch. Then this week? We're on Spring Break! 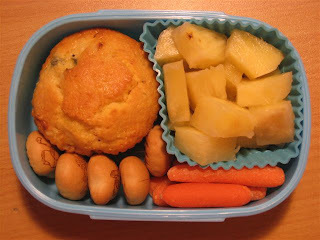 Ben had a chicken & veggie stuffed muffin, carrot sticks, pineapples and a few panda cookies. I apparently need to work on my photography skills since the whole lunch looks the same flipping color! 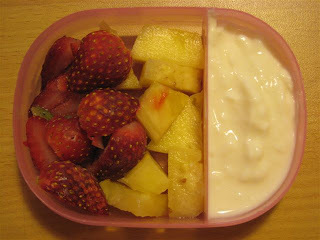 Even though Faith had hot lunch, she wanted a snack bento, so she had strawberries & pineapple with vanilla yogurt to dip it in.